The indulgence normally accorded to a man's origins is out of place in the case of Adolf Hitler, who made documentary proof of Aryan ancestry a matter of life and death for millions of people but himself possessed no such document. He did not know who his grandfather was. Intensive research into his origins, accounts of which have been distorted by propagandist legends and which are in any case confused and murky, has failed so far to produce a clear picture. National Socialist versions skimmed over the facts and emphasized, for example, that the population of the so-called Waldviertel, from which Hitler came, had been 'tribally German since the Migration of the Peoples', or more generally, that Hitler had 'absorbed the powerful forces of this German granite landscape into his blood through his father'. 1842 (Exact Date Unknown): The older brother of Johann Nepomuk Huettler, Johann Georg Hiedler, a 50-year-old "wandering miller," originally from Spital, and variously described as "shiftless" and "no good lazy," marries Maria Anna Schicklgruber. Though much older than Hiedler, she is quite prosperous and in attractively poor health. The couple will never actually live together and, despite usual custom, for reasons never made clear, her husband does not legitimize her child, Alois, then 5 years old. 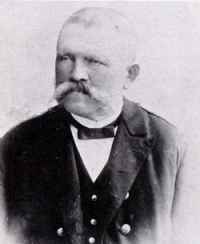 1861 Alois Schicklgruber: Birthday and new career: The upwardly mobile Alois Schicklgruber has double cause to celebrate. On his birthday, he becomes a Revenue Clerk in the service of the Austro-Hungarian Empire. After his study of science in Budapest and Vienna and physics in Berlin and Heidelberg, Lenard obtained a doctorate in Heidelberg in 1886 . . . . With the beginning of the 20s he became one of the most inveterate foes of Einstein's theories of relativity. This rejection, founded on an excessive nationalism in connection with a strong anti-Semitism, became stronger as time passed by and reached its critical stage after the national socialist seizing of power (1933). In Lenard's four-volume work of 1936/37 "Deutsche Physik" (German Physics), written on the basis of classical physics of the 19th century and with the accentuation on experimental physics, the theoretical i.e. "Jewish physics" was almost completely rejected. The parish priest of the hamlet of Doellersheim strikes out the name Schicklgruber from the birth registry, inserts the phrase 'within wedlock' to replace 'out of wedlock', and fills in the (until then) empty space for 'Father' with 'Johann Georg Hitler.' The end result of all this shady chicanery (even if Georg really was Alois's father, the 'within wedlock' line is obvious Bavarian bologna) is that Alois Schicklgruber now legally assumes the name Alois Hitler . . . . In an event that would have dramatic repercussions for the people of India, Mohandas K. Gandhi, a young Indian lawyer working in South Africa, refuses to comply with racial segregation rules on a South African train and is forcibly ejected at Pietermaritzburg. American World War I flying ace; the first American aviator flying in an American unit to achieve the status of ace. 1905 Scandinavia: After Norway refuses to recognize the Swedish king and declares its independence, Sweden and Norway agree to end their union. The Treaty of Separation will go into effect the following October. On June 7, 1917, the British 2nd Army, led by Herbert Plumer, scores a crushing victory over the Germans at Messines Ridge in northern France, marking the successful prelude to an Allied offensive designed to break the grinding stalemate on the Western Front in World War I. The Lateran Pacts had three parts: a political treaty (giving the Vatican its own micro-state), a financial convention (giving the Vatican reparations) and a concordat (giving privileges within Italy, for instance by letting the Church influence public education). In return for all of this , Mussolini received Vatican recognition of the Kingdom of Italy — of which he happened to be the dictator. Through the Lateran Pacts, as a contemporary account noted, "Mussolini has achieved a great diplomatic success, perhaps the greatest of his career." Four years later the Vatican would legitimise another dictator, Hitler, also for the price of a legal pact from which it still profits today. A national holiday was proclaimed to celebrate this propaganda coup. With the Lateran Pacts "the divided allegiance of many Italians between church and state [was] a thing of the past". Henceforth the two powers would present a united front, at least in public. Although Pius XII had moral doubts about Mussolini's attack on Ethiopia, he didn't voice them, even to the dictator. Instead, the Vatican fostered this valuable alliance and on the "Day of Faith" in 1935, the Italian Church actively supported the war effort by helping Mussolini in his nation-wide drive to collect gold wedding rings. 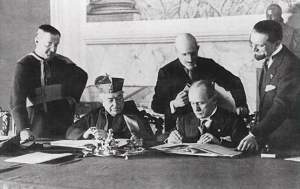 Quadripartite Pact: In Rome, the four Big Powers: Britain, France, Germany, and Italy sign the Quadripartite Pact of Guarantee proposed by Mussolini: a reinvigoration of the Locarno Pact. All parliaments will ratify this new pact except for France, which rejects it and therefore prevents it from coming into force. Holocaust: The Central Fund for German Jewry is established by Va'ad Leumi, with Henrietta Szold as chairwoman. The four million brown shirted Nazi storm troopers, the SA (Sturmabteilung), included many members who actually believed in the 'socialism' of National Socialism and also wanted to become a true revolutionary army in place of the regular German Army. But to the regular Army High Command and its conservative supporters, this potential storm trooper army represented a threat to centuries old German military traditions and the privileges of rank. Adolf Hitler had been promising the generals for years he would restore their former military glory and break the "shackles" of the Treaty of Versailles which limited the Army to 100,000 men and prevented modernization. For Adolf Hitler, the behavior of the SA was a problem that now threatened his own political survival and the entire future of the Nazi movement. 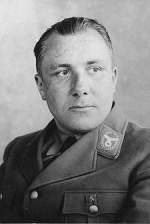 The SA was headed by Ernst Röhm, a battle scarred, aggressive, highly ambitious street brawler who had been with Hitler from the very beginning. Röhm and the SA had been very instrumental in Hitler's rise to power by violently seizing control of the streets and squashing Hitler's political opponents. However, by early 1934, a year after Hitler came to power, the SA's usefulness as a violent, threatening, revolutionary force had effectively come to an end. Hitler now needed the support of the regular Army generals and the big industry leaders to rebuild Germany after the Great Depression, re-arm the military and ultimately accomplish his long range goal of seizing more living space for the German people. The average German also feared and disliked the SA Brownshirts with their arrogant, gangster-like behavior, such as extorting money from local shop owners, driving around in fancy news cars showing off, often getting drunk, beating up and even murdering innocent civilians. At the end of February, 1934, Hitler held a meeting attended by SA and regular Army leaders including Röhm and German Defense Minister General Werner von Blomberg. At this meeting Hitler informed Röhm the SA would not be a military force in Germany but would be limited to certain political functions. In Hitler's presence, Röhm gave in and even signed an agreement with Blomberg. However, Röhm soon let it be know he had no intention of keeping to the agreement. In April he even boldly held a press conference and proclaimed, "The SA is the National Socialist Revolution!!" Within the SA at this time was a highly disciplined organization known as the SS (Shutzstaffel) which had been formed in 1925 as Hitler's personal body guard. SS chief Heinrich Himmler along with his second-in-command, Reinhard Heydrich, and Hermann Göring, began plotting against Röhm to prod Hitler into action against his old comrade, hoping to gain from Röhm's downfall. On June 4, Hitler and Röhm had a five hour private meeting lasting until midnight. A few days later Röhm announced he was taking a 'personal illness' vacation and the whole SA would go on leave for the month of July. He also convened a conference of top SA leaders for June 30 at a resort town near Munich which Hitler promised to attend to sort things out. 1935 Olympic Games: German representatives assure the International Olympic committee that 'Aryans' and 'non-Aryans' will be treated equally during the upcoming Olympic games. A lunatic abroad has had an attack of madness; does this justify wholesale suspicion of the German Catholics? You all are witnesses for the fact that on all Sundays and holidays at the main service we pray in all churches for the Fuehrer as we have promised in the Concordat. And now one can read in big headlines of the papers at the street corners, "They pray for Hitler's death!" We feel offended on account of this questioning of our loyalty to the state. We will today give an answer, a Christian answer: Catholic men, we will now pray together a paternoster for the life of the Fuehrer. This is our answer." 1938 Baltics: Latvia and Estonia sign non-aggression treaties with Germany. King George VI becomes the first British monarch to visit the United States when he and his wife, Elizabeth, cross the Canadian-U.S. border to Niagara Falls, New York. The royal couple subsequently visited New York City and Washington, D.C., where they called for a greater U.S. role in resolving the crisis in Europe. On June 12, they returned to Canada, where they embarked on their voyage home. War in the Air: French fighter planes bomb Berlin. Norway: The king leaves Tromso aboard the British cruiser Devonshire and is taken to England. On this day in 1942, Japanese soldiers occupy the American islands of Attu and Kiska, in the Aleutian Islands off Alaska, as the Axis power continues to expand its defensive perimeter. I am well satisfied with the situation up to noon today, 7th. Only at one American beach has there been serious difficulty, and that has now been cleared up. Twenty-thousand airborne troops are safely landed behind the flanks of the enemies lines, and have made contact in each case with the American and British seaborne forces. We got across with small losses. We had expected to lose about 10,000 men. 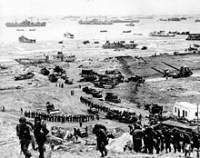 By tonight we hope to have the best part of a million men ashore, including a considerable quantity of armor (tanks), all landed from special ships or swimming ashore by themselves. In this latter class of tanks there have been a good many casualties, especially on the American front, owing to the waves overturning the swimming tanks. We must now expect heavy counterattacks. (1) The enemy's complete mastery in the air. (2) The skillful and large-scale employment of enemy parachute and airborne troops, (3) The flexible and well-directed support of the land troops by ships' artillery of strong English naval units ranging from battleship to gunboat. (4) The rehearsal of the enemy invasion units for their task; most precise knowledge of the coast, of its obstacles and defense establishments, swift building up of superiority in numbers and material on the bridgehead after just a few days. Opposed to this stands the quality of the German soldier, his steadfastness and his unqualified will to fight to the fast with army, navy and air force. All three branches of the service have given their best and will continue to give it. (a) The enemy had hoped to be able to surprise us. He did not succeed. The beginning of landings from the air on the Western Bay of the Seine and in the Cotentin was on June 6, 1944, at about 0100, under conditions of cloudy, overcast weather with a rather strong wind, intermittent showers and rough sea up to four degrees; at the same time at various sectors of the front strong enemy air formations delivered bombing attacks in the rear area. The enemy thereby wished to bring about an air raid alarm and make us take cover in order to be able to drop his parachute troops with as little risk of observation as possible. In several places parachutists turned out to be dummies (with boxes containing explosives). Purpose: Splitting up of local reserves and withdrawal from the decisive spot, involving loss of time for the defender. Airborne troops in many transport gliders of various sizes cut loose, in accordance with a precisely worked out plan, over the sea or at widely separated points over land, and on the whole they found their designated landing spots accurately. Nevertheless, these landings from the air were no surprise, since our own command and troops had counted on them for weeks and were prepared. Thus the enemy parachute and airborne troops suffered heavy—and in parts even extremely bloody—losses, and were in. most, places annihilated in the course of the battle. They did not succeed in breaking up the coastal defense from the rear. Only in the American bridgehead north of Carentan, by our own attack on three sides, were the enemy airborne troops compressed in the direction of the coastal defense after tough fighting for days, and thus they could link up with their own land forces which had already broken in and in this way were able to get reinforcement and relief. In early June, 1944, Das Reich was stationed in southwest France outside of the city of Montauban. Elements of the division began moving towards Normandy on the night of June 7th, although the armor did not depart the area until the 9th. The Canadians first came into contact with the 12th SS in the days following the Normandy landings. On D-Day+1, SS Lieutenant Colonel Karl-Heinz Milius threw his 3rd battalion at the Canadians during the battle for Authie. The North Nova Scotia Regiment and Cameron Highlanders thwarted this German counterattack, stopping the grenadiers in their tracks and bloodying the 12th SS Panzer division for the first time. The twenty-three Canadians captured by the Germans in Authie suffered a horrific fate that foreshadowed future atrocities at the hands of the SS troops. At the main intersection (at the southern end of the village) Canadian soldiers were disarmed, told to remove their helmets, and shot at close range. The young German troops further insulted the Canadian lives they had taken. In one incident, some German soldiers propped up the corpse of a murdered Canadian, placed an old hat on his head, and stuffed a cigarette box into his mouth. In another situation, eight of the lifeless Canadian bodies were unceremoniously dragged onto the street where they were repeatedly mutilated by passing tanks, trucks and armoured vehicles. Appalled French onlookers later testified that SS troops whooped like drunken pirates at their handiwork. JODL [The] Commander-in-Chief of the Navy and the Commander-in-Chief of the Air Force—with due respect to both of these gentlemen—saw the problem as a whole only from the point of view of naval or air strategy, and they saw no danger whatsoever in the Russian Navy or the Russian Air Force. What was taking place on land, of course, was of less interest to them. That explains why the strongest opposition came from the Luftwaffe and the Navy; and only the Army, in this case, was much more inclined to see the tremendous danger with which it was confronted. But in spite of this, every one of us, I myself included, warned the Fuehrer most urgently against this experiment, which should have been undertaken only if there really was no other way out. I will not take it upon myself to judge whether there might perhaps have been a political possibility which was not exhausted; I cannot judge that. THE PRESIDENT: I think you should not make comments of that sort. You must ask questions and not make comments. 1946 Television resumes in Britain for the first time since the beginning of World War II, as announcer Leslie Mitchell begins the broadcast with: "As I was saying before I was so rudely interrupted." Oswald Pohl was a Nazi official and member of the SS (with a rank of SS-Obergruppenfuehrer), involved in the mass murders of Jews in concentration camps, the so-called Endloesung (Final Solution). Pohl was born on June 30 1892, in Duisburg-Ruhrort as the son of blacksmith Hermann Otto Emil Pohl and his wife Auguste Pohl (née Seifert); he was the fifth of a total of eight children. After graduating from school in 1912, he became a full-time soldier in the German navy, being trained in Kiel and Wilhelmshaven as well as the Caribbean and south-east Asia. During World War I, he served at the Baltic sea and the coast of Flanders. Pohl also attended a navy school, and became paymaster on April 1, 1918; most of his time in the navy from then on was spent in Kiel. On October 30 the same year, he married. After the end of the war, Pohl attended courses at a trade school and also began studying law and state theory at the Christian-Albrechts University in Kiel; he dropped out of university soon again, though, and became paymaster for the Freikorps "Brigade Loewenfeld", working in Berlin, Upper Silesia and the Ruhr basin. In 1920, like many others involved in the Luttwitz-Kapp Putsch, he was accepted into the Weimar Republic's new navy, the Reichsmarine. 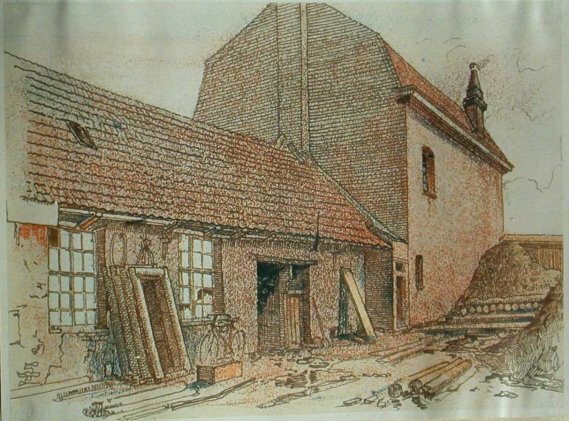 Pohl was transferred to Swinemunde in Poland in 1924. One year later, in 1925, Pohl became a member of the SA, then finally joined the re-founded NSDAP (the Nazi party) on February 22 1926, as member #30842. He met Heinrich Himmler in 1933 and became his protege. He was appointed chief of the administration department in the staff of the Reichsfuhrer-SS ("Reich leader SS", RFSS) and given the rank of SS-Standartenfuehrer on February 1, 1934, and began to influence the administration of the concentration camps. His career continued when he was made Verwaltungschef (chief of administration) and Reichskassenverwalter ("Reich treasurer") for the SS on June 1, 1935, then initiated the Inspektion der Konzentrationslager ("inspection of the concentration camps"), an organization to organize and oversee the administration of the concentration camps. 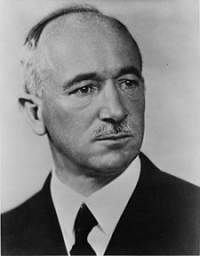 He also founded the "Gesellschaft zur Foerderung und Pflege deutscher Kulturdenkmaeler" ("Society for the preservation and fostering of German cultural monuments"), which was primarily dedicated to restoring the Wewelsburg, and old castle that was supposed to be turned into a cultural and scientific headquarters of the SS at Heinrich Himmler's request. The "society" soon became a part of Pohl's SS administration office. Pohl also left the church in 1935, and, in June 1939, became chief of both the "Hauptamt Verwaltung und Wirtschaft" ("main bureau [for] administration and economy", part of the SS) and the "Hauptamt Haushalt und Bauten" ("main bureau [for] budget and construction", part of the Reich's ministry for the interior). On February 1, 1942, both institutions were combined into the "SS-Wirtschafts-Verwaltungshauptamt" (SS-WVHA, "SS main bureau for economic administration") with Pohl in charge; among other things, the SS-WVHA was in charge of the organization of the concentration camps, deciding on the distribution of detainees to the various camps and the "rental" of detainees for forced labor until 1944. Pohl was made SS-Obergruppenfuehrer and general of the Waffen-SS on April 20, 1942. On December 12, the same year, after divorcing his wife, he married Eleonore von Bruening, widow of Ernst Ruediger von Bruening, who in turn was the son of one of the founders of the Hoechster Farbwerke, which became part of the IG Farben in 1925. In 1944, Pohl was put out of charge of the concentration camps, with the Ruestungsministerium (ministry of armament) overtaking; at the same time, the responsibility for construction was also taken away from the SS-WVHA. However, Pohl remained in charge of the administration of the Waffen-SS for the remainder of the war.